My friend and Enneagram colleague, Susan Olesek, founded the very moving, rapidly growing Enneagram Prison Project (EPP) in April of 2012. In order to do so, Susan and the EPP Board have been facing and overcoming the prejudices and stereotyping so pervasive in our culture regarding “those” who have been imprisoned, including our perception that prisoners are somehow “less than,” less flexible, less intelligent, all the way to not interested in bettering themselves and/or being beyond reproach. 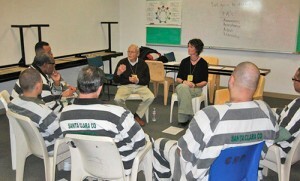 Last week, Susan invited me and EPP Board Member Suzanne Dion to join her at Elmwood Correctional Facility in Milpitas, CA, a facility where Enneagram Prison Project (EPP) started its first pilot program where Susan herself has been teaching two side-by-side 12-week classes to both female and male inmates. I went from “hearing about” what she has been doing with EPP to standing right there with her, teaching, talking, and sharing with a group of incarcerated men of various Enneagram types. What immediately surprised me was the extent of openhearted curiosity present in the attending men and the incredible awareness they had each fostered at the ten-week mark of their Enneagram style and defense patterns. In the early 1980s and before I had begun studying the Enneagram, I was working on a project in a California Youth Authority facility. I was brought in to teach a participative management style to the staff in order that their already-existing-yet-struggling transactional analysis treatment program had a chance of succeeding. The process and teachings I fostered, worked. The number of youth acting out went down significantly, grades went up dramatically, and cooperation between the youth-aged inmates and the staff grew enormously. I learned working there that these young guys were just “young,” trying to find the only way they knew to a good life and trying to learn more about self-control in order to do so.